Strain injuries are commonly reported as the top cause of work-related injury, disability and lost time. They are easily prevented. Musculoskeletal disorders (MSDs) remain the most common work-related diseases, according to this October 2007 comparative report published by Eurofound’s European Working Conditions Observatory (EWCO). The report found that MSDs were associated with strenuous working conditions and physical strain, such as tiring and painful working positions, repetitive movements, carrying heavy loads and poorly designed workstations. Work intensification and stress lead to increased occurrences of MSDs. Job rotation and team working are also associated with a higher incidence of MSDs. Lean production models require workers to perform repetitive tasks at a higher work pace, resulting in a higher prevalence of MSDs. Enhanced autonomy over working methods, work pace and choice of breaks is associated with a reduction of MSDs. The risk is lowered where there is training provided by employers and consultation about working conditions and about organisational factors. UNISON has launched a campaign to get better management of all workplace musculoskeletal injuries. Announcing the move on Repetitive Strain Injuries Prevention Day, the last day in February each year, the union said a random sample of 50 strain injury compensation claims made by UNISON members found that 90 per cent of these claims resulted from basic failings in risk assessments, while one-in-five of the claims was caused by staffing difficulties, with staff often being forced to single-handedly lift loads that should have required two people or more to do it. Low-level letterboxes should be banned to prevent postal workers straining their backs or being bitten by dogs, a Conservative MP has said. Proposing new legislation, Vicky Ford called for all new letterboxes to be installed at a height of between 70cm and 170cm. BBC News Online. Risks 881. HSS Magazine. Usdaw news release. HSE Go Home Healthy campaign, including guidance on musculoskeletal problems. Risks 877. A delivery driver has received a substantial payout after suffering a hernia at work. Unite member Peter Warwick, who was a DHL driver when he suffered the injury, strained his groin trying to move an unusually heavy pallet as part of a delivery to a TK Maxx store. Unite legal report. Risks 875. Britain: Want to know more about musculoskeletal risks at work? The TUC has produced a short online guide for union health and safety reps, signposting where they can get Health and Safety Executive (HSE) advice and guidance on musculoskeletal disorders. The guide is badged jointly with the HSE. It provides links to HSE toolkits, regulations and guides on musculoskeletal disorders. Musculoskeletal disorders - HSE material for health and safety reps, TUC/HSE, September 2018. Risks 865. Ford news release. BBC News Online. Risks 862. The Federation of Civil Construction Workers in Peru (FTCCP), working with the global union BWI, has launched a ‘25 Kilos…No More!’ campaign ahead of the games. “In Peru the weight of cement bags is 42.5 kilograms, which causes permanent injuries and health problems to the workers,” said Luis Villanueva, the deputy general secretary of the FTCCP. Poultry workers in the United States have won an important victory after campaigning against an industry’s attempt to remove the maximum line speed. If the petition by the National Chicken Council to the Food Safety and Inspection service (FSIS) had been successful it would have reversed an Obama administration decision to limit the number of birds processed to 140 per minute, a ceiling designed to protect workers from strain injuries and other risks. IUF news report. UFCW news release. RWDSU news release. Confined Space blog. Risks 836. The US food union has warned an official move to speed up pork processing lines puts greed before the health of workers. The union UFCW was speaking out after the US department of agriculture (USDA) announced a proposal to allow pork producers to run their slaughtering lines as fast as they want, in exchange for conducting their own privatised food safety inspections. UFCW news release. NELP news release. The Pump Handle. Risks 835. California’s workplace health and safety regulator has voted unanimously to introduce new rules to reduce the injuries commonly experienced by hotel housekeepers. Cal/OSHA approved the ‘Hotel Housekeeping Musculoskeletal Injury Prevention’ standard, which had been promoted by the union Unite Here, at a meeting attended by hotel housekeepers from across the state. Unite Here news release and new California standard on Hotel Housekeeping Musculoskeletal Injury Prevention. IUF news release. Risks 834. The European Union and national governments must do more to support workplace health and safety reps tackle work-related strain injuries, the European Trade Union Confederation (ETUC) has said. The union body says action to prevent strain injuries has been stalled for a decade. ETUC news release and male and female MSDs infographics. Risks 806. Tesla’s much-vaunted and highly automated “factory of the future” in Fremont, California, presents some old fashioned hazards for the workers making Elon Musk’s cutting edge electric cars. Reports have revealed the relentless work pressure from Musk’s aggressive production goals are causing high rates of sometimes life-changing injuries. Capital and Main. The Guardian. American Prospect. Risks 801. Car component manufacturer MAHLE Powertrain Limited (MAHLE) Ltd has been fined after six workers experienced back injuries from repeatedly lifting heavy car engine parts by hand. An HSE investigation found that workers who were based on two of the company’s production lines were expected to manually lift engine components weighing between 14 and 21kg, hundreds of times during a shift. Europe’s unions have repeated their call for urgent action to tackle the epidemic of work-related back, shoulder, neck, elbow, hand and knee pain that results in a severe loss of quality of life for workers and millions of days off work. The European Trade Union Confederation (ETUC) says this number one cause of occupational sickness in Europe comes at a cost to employers, workers and health services estimated at €163 billion (£147bn) a year. ETUC news release. EULAR news release and conference webpage. Risks 772. Work factors are a major pain in the neck, a study has found, but has highlighted the prevention measures that could put the problem behind us. Working with academics, investigators at the US government’s National Institute for Occupational Safety and Health (NIOSH) confirmed the link between neck pain and specific psychosocial and organisational risks in the workplace. NIOSH Research Rounds, volume 2, issue 2, August 2016. Haiou Yang and others. Workplace psychosocial and organizational factors for neck pain in workers in the United States, American Journal of Industrial Medicine, volume 59, issue 7, pages 549-560, July 2016. NIOSH resources: Persistent pain in the neck! What resources help you prevent MSDs in the workplace? Risks 765. Hazards news, 27 August 2016. Nine out of every ten hotel housekeeping workers in London suffers from back pain caused by their job, a union survey has found. Over threequarters of the chefs surveyed by Unite reported having witnessed an injury or a near miss caused by fatigue, with the union saying its report, ‘Unethical London’, exposes the low pay and exploitative work practices that have been allowed to flourish unchecked in the multi-billion hotel industry, which employs 100,000 people in London. Unite news release and Unethical London report. Risks 765. A Unite member has been awarded £30,000 in damages after developing a repetitive strain injury (RSI) from excessive use of a computer keyboard. The 31-year-old woman, whose name has not been released, suffered a strain injury to her right wrist while working as an administrator at an unnamed charity, where she would spend up to eight hours a day entering data onto a computer. Thompsons Solicitors news release. Risks 745. Poultry workers in the United States suffer extremely high rates of injury, earn poverty wages, and work in a climate of fear, Oxfam America has said. The group says its report, based on two years of research, is central to a new nationwide campaign to expose the human cost of the modern poultry industry. EU-OSHA news release and summary of the ESENER 2 findings. ETUI news release. Risks 709. A chicken processing firm in the US enforced limb-crippling line speeds and didn’t like its workers leaving the line, even to go to the toilet. The Allen Harim Foods plant in Harbeson, Delaware, was cited by the Labor Department’s safety regulator OSHA for nine violations, with the proposed penalties totalling $38,000. Sweeping new regulations for poultry plants announced by the US Department of Agriculture (USDA) will leave processing lines running at their current speeds – a decision that spares workers from an increase but still forces them to endure the current dangerously fast pace, unions and campaigners have said. “Although the most dangerous provision has been removed from this rule, poultry workers still face punishing line speeds and other conditions that lead to widespread and serious injuries,” said Michelle Lapointe, Southern Poverty Law Center (SPLC) staff attorney. A simple plan of action backed up by a commitment from senior management could be the best way for employers to ensure their workers get regular screen breaks, according to a new study funded by the Institution of Occupational Safety and Health (IOSH). IOSH teamed up with academics at the University of Derby to investigate what can be done to encourage office and call centre workers to take more postural breaks. A series of tragedies have cast further doubt on the government’s decision to exempt supposedly ‘low risk’ workplaces including shops from routine safety inspections. Critics of the government strategy to exempt retail and other “low risk” workplaces from preventive inspections also point out the risk rating ignores the sometimes sky high occupational disease risks in these jobs. Widespread law breaking by white collar employers is going unpoliced and is resulting in office workers being injured by shockingly designed workstations, the TUC has warned. Speaking after an ergonomics study found half of office workers reported they'd had no workstation risk assessment in the last 12 months, TUC head of safety Hugh Robertson said the government’s hands-off directive to official safety enforcers was leaving workers unprotected and at risk of serious disease. A lack of positive practices to support people with musculoskeletal disorders (MSDs) in work is leaving hundreds of thousands at risk of lost earnings, reduced productive working time and early retirement. ‘Taking the strain: the impact of musculoskeletal disorders on work and home life’ found just over half of employed respondents reported a loss of earnings due to the condition. Unions are calling for an ambitious European agenda on workplace health and safety, and are demanding EU-wide action to tackle work-related cancers and musculoskeletal disorders (MSDs). They warn that the economic crisis should not be used as an excuse to backtrack on safety standards. Almost twice as many piece rate workers suffer from workplace injuries as those on standard contracts, according to research from Lancaster University Management School. The increased productivity gained by employers from piece rate work is lost through increased absence and the cost of compensation, the authors note. Union bodies have called on the European Commission to “assume political responsibility” and produce “without delay” a draft European Union-wide law to protect workers from musculoskeletal injuries. The demand for action on workplace strains comes in a statement from the European Trade Union Confederation and four other Europe-wide trade union bodies. The TUC has criticised a business group’s drive to block new protections from some of the most serious occupational health risks of modern workplaces. EEF, the lobbying group for manufacturing employers, is urging the government to block possible European Union-wide measures to improve protection from workplace stress and strain injuries. A GMB member needed surgery to correct a hernia which could have been avoided if his employer had undertaken and acted on a simple risk assessment. Andrew Kelly, 47, needed the major surgery after moving several objects weighing up to 40kg during an eight-hour shift for global recycling giant Sims Group UK. A warehouse operative has received £4,500 in compensation after his employer admitted blame for an injury that left him unable to carry out everyday tasks and that took more than eight months to heal. GMB member Paul Pritchard, 37, was forced to take almost four months off work when he was injured whilst packing aeroplane components at the Rolls Royce Depot in Sunderland for Mitie Group. A factory worker who developed a repetitive strain injury has been awarded £3,000 compensation for his injuries in a union-backed claim. Unite member Geoffrey Coleman, 41, an employee at an unidentified factory in Kendal, Cumbria, sustained his injuries while packing a new product in the finishing department. An initiative to address greatly elevated strains risks in bed manufacture has met with some success, says the Health and Safety Executive (HSE). The watchdog says “employees in the bed manufacturing industry are around twice as likely to suffer manual handling injuries such as back and upper limb disorders than those in any other manufacturing sector,” with jobs like the manual handling of mattresses particularly problematic. A Unite member working as a painter for Caterpillar needed two operations to correct a hernia following a workplace injury has received more than £7,000 in compensation. Keith Robinson, 43, needed the major surgery after moving a 12ft high and 30ft long walkway to access a work area. An HGV driver has received £13,500 in compensation after developing a repetitive strain injury (RSI) doing her job for a blue chip company. The GMB member from Leicestershire, whose name has not been released, has been left with a seriously strained elbow after being forced to attach brakes on her truck twice a day. A new downloadable tool is now available that the Health and Safety Executive (HSE) says can help reduce the likelihood of employees suffering from musculoskeletal disorders (MSDs) of the upper limbs associated with repetitive tasks. The Assessment of Repetitive Tasks (ART) tool, developed by the Health and Safety Executive (HSE) and Health and Safety Laboratory (HSL), can help identify where the significant risks lie, suggest where to focus risk reduction measures and help prioritise improvements, the official safety agencies say. Action to change the workplace is necessary to secure an early return to work for people with chronic low back pain. A study published online this week in the British Medical Journal concludes those receiving a programme of integrated care, directed at both the patient and the workplace, return to work on average four months earlier than those receiving usual care. Unite the union have been running a campaign to try to prevent baggage handlers from having their backs damaged by having to move heavy luggage. Unite says that baggage handlers are five times more likely to be injured, although the cramped conditions they work under are also a major factor. To coincide with the launch of phase 3 of its ‘Shattered Lives campaign’, the Health and Safety Executive (HSE) slips and trips website has been rebranded with what the watchdog describes as a new design, better navigation, news and resources. A welder has developed two serious occupational diseases in his hands as a result of using vibrating tools. The 56-year-old Unite member from Wolverhampton, whose name has not been released, was diagnosed with carpal tunnel syndrome (CTS) and hand arm vibration syndrome (HAVS). A GMB member who was forced to continue lifting heavy objects after he damaged his back, leading to further injury, has received £13,500 in compensation. Alan Titley, 62, from Atherstone in Warwickshire, suffered the permanent injury as result of his work for G4S Cash Services UK in Coventry. A school assistant has received a “substantial” sum in compensation after she suffered a slipped disc while lifting heavy objects at work. GMB member Yvonne Macklin, 48, from Colchester in Essex, was helping a colleague to lift a heavy insulated box containing school lunches; she has been unable to work since the incident in March 2006, is in constant pain and now has a limp and must use crutches. A waste lorry driver who needed surgery after he suffered two slipped discs caused by lifting heavy bins has received a “significant” out of court payout. Unite member Les Webb, 49, was off work for seven and a half months following the 2006 incident while working for Viridor Waste Management in Plympton. Four years after a government report found slaughterhouse workers in the US faced more than double the injury rate of manufacturing as a whole, a new survey suggests conditions have deteriorated still further. Almost threequarters (73 per cent) of the Nebraska meatpacking workers surveyed stated that the speed of the line had increased in the past year and more than six out of 10 (62 per cent) said they had been injured in the past year. Muscle and joint pain accounts for almost half of all sick leave, both in the UK and across Europe, a study has found. Half of all of all sickness absence (49 per cent) is caused by musculoskeletal disorders (MSDs), concluded the Fit for Work Europe report by The Work Foundation, a London-based think tank. A concrete technician who developed a debilitating workplace strain injury fears he may never find work again after he was made redundant. GMB member Paul Flintoff, 46, from Selston in Nottingham was diagnosed with carpal tunnel syndrome (CTS), a painful lower arm disorder which can be caused by prolonged use of hand-held vibrating tools. Unite members from airports all over the UK are to lobby their MPs and will invite them to take part in a ‘baggage challenge’. The parliamentarians will be given the opportunity to try shifting the heavy bags baggage handlers deal with routinely – and will be asked to back the union’s campaign to reduce the weight of checked-in baggage from 32 to 23 kilograms per item. The Chartered Society of Physiotherapy (CSP) is calling on the government to encourage employers to do more to prevent repetitive strain injury (RSI). The physios’ union says latest figures from the Health and Safety Executive (HSE) show there has been little progress in tackling RSI in the last six years. 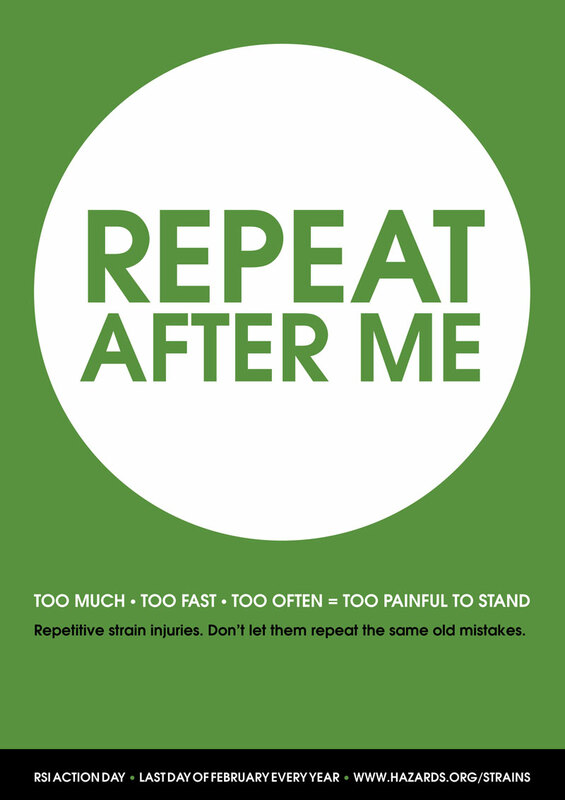 This 28 February marks the 10th anniversary of International Repetitive Strain Injury Awareness Day. The event – which falls on the last day of February each year – is used by occupational disease advocacy organisations, campaigns and trade unions to highlight strain injuries risks and prevention at work and in the community. A petite shopworker has successfully sued her employer after developing a strain injury caused by reaching for the till and the shop's chip and pin device. Usdaw member Jill Hyndman, 51, who is only four feet nine inches tall, claimed her employer, the Co-op in Cinderford, did not take her small stature into account when they redesigned their till areas a few years ago. A Unite member working as a contract electrician has been awarded £250,000 for the back injuries he sustained when he fell at a Tarmac site in 2003. Union law firm Rowley Ashworth rejected the insurer’s offer of contributory negligence to agree liability on a 75:25 split in favour of the member and issued court proceedings; instead, a final settlement of £250,000 was achieved three weeks before the scheduled trial. A nursery nurse from Newcastle has secured £75,000 damages following a serious back injury at work. Gillian Scott, 42, a member of UNISON, was working at Newcastle’s Royal Victoria Infirmary when the contents of a box slipped as she was placing it in a cupboard, causing her to fall against the door which sprung back on her. More than two thirds of workers now suffer from repetitive strain injury, costing £300 million in lost working hours, a new study has found. The research from Microsoft revealed cases soared by more than 30 per cent last year because more staff than ever work both inside and outside the office. Call centre and other computer-based workers in India are paying a high price for the job, with significant numbers suffering musculoskeletal disorders (MSDs), according to a new report. Dr Deepak Sharan, the medical director of the RECOUP Neuromusculoskeletal Rehabilitation Centre in Bangalore, found that 75 per cent of the 30,000 individuals in his ongoing study in India’s ‘Silicon Valley’ are afflicted with musculoskeletal symptoms related to their work. 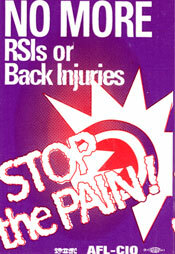 More needs to be done to protect workers from repetitive strain injury (RSI), physios’ union CSP has warned. It says RSI rates have been rising in recent years and the problem now costs the UK economy £300m a year in lost working time, sick pay and administration. A Tube driver has been granted permission to sue London Underground (LUL) after developing a debilitating wrist injury. RMT member Latona Allison developed the repetitive strain injury tenosynovitis in her right wrist and now cannot work as a driver. Union reps should start gearing up for International RSI Day, the last day of February every year. In 2008 - a leap year - that means Friday 29 February. Whether you do a workplace risk assessment, a bodymapping session or just a bit of general awareness raising, make sure you do something. The Health and Safety Executive (HSE) is reminding companies of their legal duties on manual handling after an employee was injured when a 50kg sack of basmati rice fell on his neck. East End Foods plc pleaded guilty to safety offences and was fined £25,000 with £28,000 costs. A factory worker from Port Talbot who was medically retired after suffering a repetitive strain injury (RSI) has received almost £17,000 in compensation. Unite member Barbara Newall’s job was to bag the accessories that accompanied a DVD player; this included a remote control, a battery pack, an RF cable and, in some cases, an additional RF lead - she would pack approximately 4,500 bags per day. Baggage handlers nationwide are campaigning for the maximum luggage weight limit allocated to each airline passenger to be cut. Unite, the workers' union, says baggage handlers want the Health and Safety Executive (HSE) to reduce the maximum weight limit from 32kg to 23kg a bag. California’s workplace safety regulator has charged that the duties performed by housekeepers at a hotel - scrubbing, bed making, vacuuming - violate the state's repetitive strain injury rules. A citation issued to Hilton Los Angeles Airport hotel (LAX Hilton) “confirmed what workers have been telling their physicians and management at the LAX Hilton, that this work and the workload are causing them pain and injury,” said Pamela Vossenas, senior health and safety representative for the hotel division of Unite Here. Strain injuries are commonly reported as the top cause of work-related injury, disability and lost time. They are easily prevented - and there has never been a better time to take action. Health and safety minister Lord McKenzie has added his weight to a union bad backs prevention initiative. The minister joined trade union safety representatives and experts from the Health and Safety Executive (HSE) on a London unionlearn course, to mark the start of European Health and Safety Week. Workplace strain injury victims are being let down by a shortage of physiotherapists – yet most physio graduates are out of work. Physio’s union CSP says just 24 per cent of physio graduates who could be treating patients have a job. The Ministry of Defence (MoD) has paid out almost £500,000 after an RAF computer clerk developed a chronic repetitive strain injury caused by an increased work rate. A total of £484,000 in compensation and legal costs was awarded following the onset of the condition in the hand of the unnamed employee. Postal union CWU has launched a new guide to tackle the high rates of workplace strains suffered by mail delivery staff. It says musculoskeletal injuries in Royal Mail are running at over 10 times the rate for workplaces overall. Nestlé UK Ltd has paid compensation to four workers at the coffee making giant's site at Burton on Trent after each of them developed tennis elbow – mirroring the experiences of workers at another of the company’s plants in Brazil. Steven Davis, received £11,000, a colleague £4,000 and two other workers undisclosed sums after developing the occupational strain injury. A production worker has secured £7,000 compensation after developing debilitating hand and arm conditions caused by exposure to vibrating tools. The union GMB has secured the payout from two former employers of John Coggon, 52, who was diagnosed with vibration white finger (VWF) and carpal tunnel syndrome (CTS) in September 2005 following his employment with National Power from 1977 to 1992 and then Newells from 1992 to 2002. The health service is too stretched to deal with the one million plus workers with a musculoskeletal disorder (MSD) caused or made worse by work, physios’ union CSP has warned. A Guardian newspaper night editor who says she was refused access to the company physiotherapist after developing crippling elbow pain has been paid £37,500 in damages for repetitive strain injury (RSI). Andrea Osbourne, who had been a casual at the paper for two and a half years, worked almost exclusively using a mouse, at speed, for an average nine hours a night, and up to 45 hours a week, without a break. Workers performing jobs that require heavy work are far more likely to take long-term sick leave, a Swedish study has found.